Militants can resort to offensive along the entire line of contact, intelligence says. Over the past day, Russia-backed terrorist forces 14 times shelled the positions of the Armed Forces of Ukraine. In half of the cases, Ukrainian servicemen returned fire to suppress the enemy. Three Ukrainian servicemen were killed amid shelling, the press center of the anti-terrorist operation reported by on Facebook on Monday, 18 December. The report says that the militants continue to blatantly breach the Minsk agreements and use prohibited weapons, notably mortars and heavy artillery. In the Luhansk sector, the Svitlodarsk bulge was the center of tension. Here, the terrorists in the evening fired heavy 152-mm, mortars, grenade launchers, and machine guns at the positions of the ATO forces stationed in the Luhansk Region. In the same area, the enemy used 120-mm mortars to shell the ATO positions in Zaitseve and Travneve. In the Donetsk sector, it was "hot" along the Azov Sea area, where the militants shelled the fortifications of Ukrainian armed forces near Lebedynske and Pavlopil. In the afternoon, the militants also fired IFV weapons at Hnutove. It was also restless near Kamyanka, where the enemy used the entire range of infantry weapons. "According to intelligence, because of the announced plans of the Russian Defence Ministry to withdraw Russian officers from the General Center for Control and Coordination of the Ceasefire and Stabilization of the Line of Delineation of the Parties, the enemy 19 December 19 can resort to aggressive offensive actions along the entire contact line in the ATO zone," the ATO headquarters said in a release. 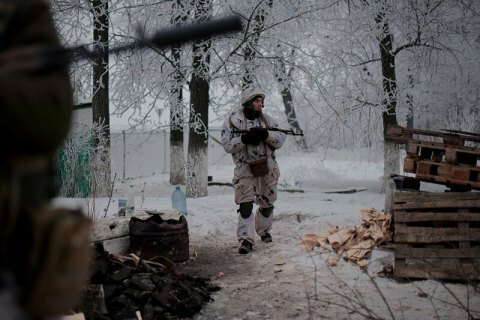 In particular, it is reported that the militants may plan to intensify the activity of sabotage groups at defence facilities, objects of energy and transport infrastructure, and intensify provocative shelling of Ukrainian positions and residential neighborhoods of settlements along the contact line. In order to accuse ATO forces of violating the Minsk agreements, the militants shell our positions from heavy artillery, reactive systems, tanks and other weapons. "Such provocations are aimed to disturb the local population with a view to stir negative attitude, and even aggression towards Ukrainian troops. As a rule, the aggressor mainly activates such provocations on the eve of the consultations in "Normandy format" and the meetings of the trilateral contact group in Minsk [the nearest is slated for 20 December], the planned visits of OSCE monitors, the Red Cross and the media to discredit Ukraine in the eyes of the international community and the groundless accusations of violating the Minsk agreement," the ATO staff said. On 12 December, US President Donald Trump signed a defense budget for 2018 that provides for the possibility of providing Ukraine with lethal weapons of a defensive nature.